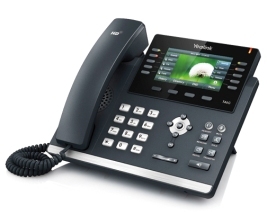 The Yealink T46G is an impressive looking color screen IP Phone that is part of the Yealink SIP-T4 series. This 6 line model delivers Gigabit connectivity, a large backlit 4.3" color display with XML browser, HD audio, Bluetooth and a host of other advanced features packaged in an easy to use device. This is an Editor's review of the Yealink T46G SIP phone that also includes technical specifications, links to helpful documents and user reviews. First impressions out of the box are that this is an impressive looking, robust, and well made phone. All the buttons are nice and big, and are all well labeled and easy to read with well a designed layout. No need to guess what the symbol on each key means. The next thing that strikes you is the large 4.3" 480 x 272 pixel backlit color display. After powering the phone up the display is even more impressive looking with large font, easy to read menus making overall navigation extremely easy. The combination of four soft-keys and six navigation keys work well for navigation and are very intuitive. Everything is really easy to find and configure. The phone has a USB port that can be used to connect the Yealink BT40 Bluetooth dongle which in turn enables a Bluetooth headset to be used. A regular wireless headset from Jabra, Plantronics or Sennheiser can also be used with the addition of the EHS36 wireless headset adapter that connects to the phone via the EXT port. There are 10 programmable line keys that can be configured with up to 27 different features with the help of a multi-page view. These feature options are Line, Key Event, Intercom, URL, URL Record, ACD, Speed Dial and BLF and are accessible via the Menu -> Call Features -> DSS Keys menu selections. This device is expandable to add up to 6 Yealink EXP40 expansion modules to create a powerful attendant console. Each EXP40 adds 40 additional keys resulting in a potential maximum of 267. Outstanding crystal clear call quality using handset, speaker and headset. Extremely easy to use call handling features such as hold, transfer, call waiting, conference, etc. The Yealink WF40 WiFi adapter can be used on the T46G (Figure 1 below). Costing around $25, this is great for those with limited hard wiring for Internet access. Note that in order to use this adapter on the T46G, your firmware needs to be at least version 28.81.0.15. Some may find the web browser somewhat complicated to use as there are so many features that can be configured. This is not really a bad thing in all honesty as this should be easily overcome with some reading or training, and is perhaps a necessary trade off to have access to this number of features. While we understand the logic in not embedding the Bluetooth functionality in the actual phone (USB Bluetooth adapter required), it would be nice to not have to spend around $30 on the dongle to enable this feature. Bluetooth is typically only available on the most high end phones so having access to this feature in the first place is a great option. Note that the USB port is only for the Bluetooth dongle and cannot be used for anything else such as adding an additional microphone. Phones with this level of features and functionality often include touch screen functionality. If touch screen is a must have feature then go for the Yealink T48G or evaluate similar devices from other manufacturers. Sharp looking and robust phone that comes loaded with features that include 6 lines, HD Audio, Gigabit, Bluetooth, 27 Programmable keys and a large color TFT LCD display. This phone can typically be purchased for around $175 which we consider to be great value for money when compared to similar alternatives from other device manufacturers. Firmware version 28.81.0.15 supports the WF40 WiFi USB adapter ($25). The Yealink T46G SIP phone is an enterprise grade phone that would work well in any office for any employee and will impress anyone that uses it. In particular, managers and executives that are heavy phone users will enjoy the impressive features and functionality that this device has to offer. A less expensive option may however be a better choice for your average user that does not require a large color display or up to 6 phone lines. In summary though, if you are shopping for a device with this level of features then it is highly recommended that you include this phone in your overall evaluation, as it will likely be tough to beat on both price and functionality. Quick Installation Guide and Quick Reference Guide. The T46G phone, handset and cord. Approximately 4 feet long Ethernet cable. No power supply as this is a PoE phone. The power supply can be purchased separately if required and only cost around $10 to $12. Connecting the Ethernet, handset and power cables is obvious and the device powered up with no issues. As a DHCP server was already on the network, the phone was automatically assigned an IP address and was immediately ready for provisioning. To get the IP address, go to the T46G and select the menu button and then status. 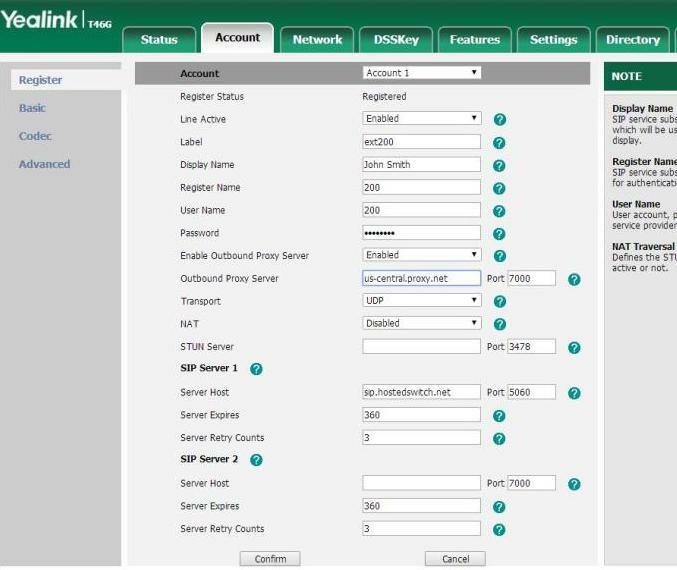 The IP address of the phone is then displayed and can now be entered into a web browser to enable access to the Yealink web interface that allows easy phone configuration. Please note that both username and password are "admin". Before getting into the provisioning of this phone, it is worth checking what firmware version is present and if there is a newer firmware version available. In this case the phone was pre-loaded with firmware version 28.72.0.2. 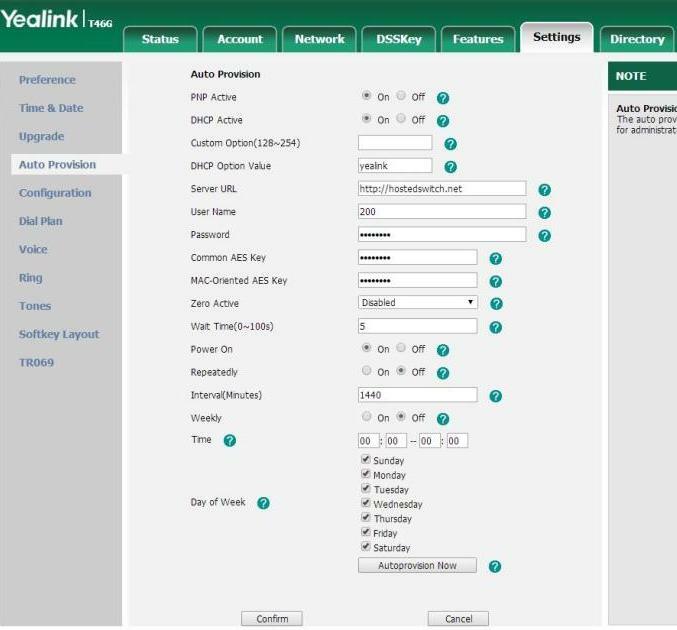 A quick check of the Yealink website showed that the latest firmware version is currently 28.72.0.45 so the existing version is quite a few releases behind. It is also worth checking the release notes for the firmware version to get an idea of what bugs have been fixed between revisions and if any additional features are supported. In this case, the firmware was updated to the latest version. This was accomplished via the web interface using the settings -> upgrade menu items. It took around 4 minutes to complete the upgrade and there were no issues. This device was manually provisioned and quickly setup. The Yealink menu is slightly different from other Yealink phones we have tested and we found it to be slightly less obvious to configure. Line Active - Enable this field when you are ready to register the phone line. Label - This is the name that will appear on your phone display for this line. Display Name - This is the name that your phone will display when calling another phone. Register Name - This is provided by your provider and is tied to your hosting account or IP PBX. User Name - Your extension number. Password - this is to authenticate your information with your provider and allow registration. Outbound Proxy - The IP location of a network when the phone is outside the LAN. SIP Server 1 - IP address of the PBX that will route your calls. SIP Server 2 - Redundant server. This field is not required to be completed. Confirm these settings and the phone should register. Next go to the "Advanced" menu and set the "Local SIP Server" port to a random port number that is not port 5060. The auto provisioning section is under the "settings" menu. Enter the auto provisioning server url, click the "confirm" button and your phone should be up and running as per the configuration on your hosted switch. Regardless of the provisioning option that is used, this phone should be easy to install and get up and running quickly. For additional information on selected soft-switch configurations, please read our articles on 3CX Phone Systems and FreePBX solutions. We're sorry, there are currently no user submitted reviews for Yealink T46G matching your search criteria at this time. Please add your own review or check back later as reviews are being submitted often. Can this phone be used for 5.0GHz WiFi? -> Response: The WF40 WiFi USB adapter can be used on the T46 and it supports 802.11b/g/n but unfortunately only supports the 2.4GHz band, not 5GHz. Your WiFi router likely supports both bands though.